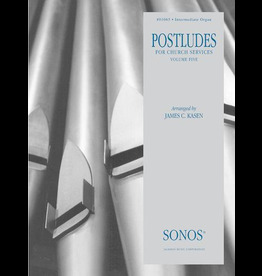 This volume of intermediate postludes for organ, contains seven grand and quiet, subtle settings of hymn tunes that allow the organist to extend worship beyond the benediction. 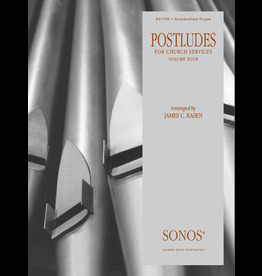 Seven intermediate organ postludes for church services, arranged by James Kasen. Seven, beautiful postlude hymn settings for organ solo, arranged by James C. Kasen. Seven intermediate organ postludes for church services, arranged by James C. Kasen. 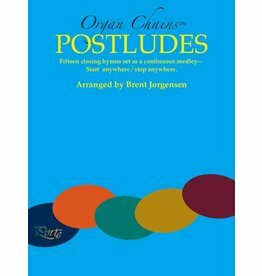 Intermediate organ Christmas arrangements for postlude. Arranged by James Kasen. Eight hymn arrangements for organ postlude, ranging in difficulty from medium to medium-difficult by James C. Kasen.